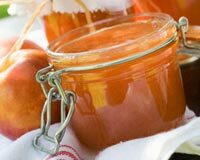 Nectarine Jam is a delicious Italian marmalade. Learn how to make/prepare Nectarine Jam by following this easy recipe. Take a skillet and add nectarines, sugar and lemon juice. Simmer for about 30 minutes at low heat. Skim foam from the top of the fruit at the end of cooking. Put it into sterilized jars. After filling the jars, return it to a boiling water bath for about 10 minutes.